Home > Students > FAQ > How does the Solar System boundary affect me? How does the Solar System boundary affect me? This graph depicts the fraction of high energy cosmic rays (greater than 100 MeV) that pass through the boundary of the solar system. 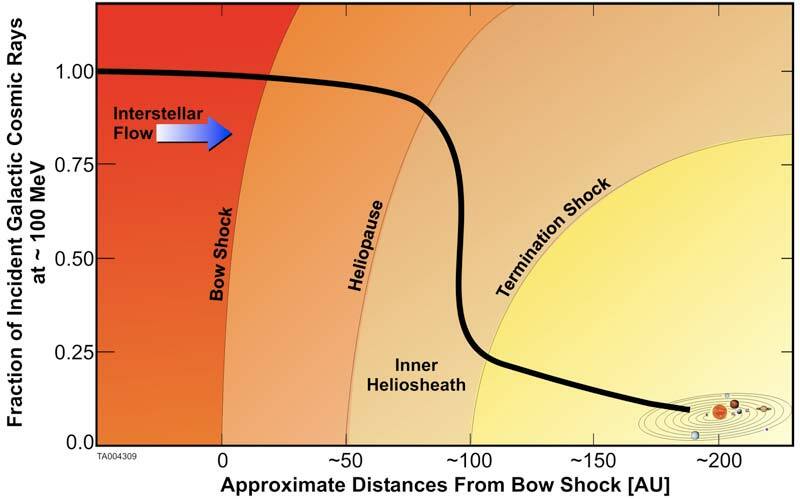 100% of them are present outside of the Bow Shock. There is a small dropoff in the number that make it through to the heliopause. More than 50% are stopped between the heliopause and termination shock, which is at approximately 100 AU. This leaves a fraction less than 25% to permeate to the inner solar system. The Solar System boundary may be defined as the region where the solar windA stream of charged particles, mostly protons and electrons, that escapes into the Sun’s outer atmosphere at high speeds and streams out into the solar system. slows down and interacts with the interstellar mediumAll the gas and dust found between stars.. If the Solar System did not have a boundary, or if the boundary changed size so that it was inside the orbit of the Earth, then there would be at least 4 times the amount of cosmic raysCharged atomic particles moving in space with very high energies (the particles travel close to the speed of light); most originate beyond the solar system, but some of low energy are produced in solar flares. in the Solar System. Luckily the Earth’s magnetosphereThe region around a planet where particles from the solar wind are trapped by the planet’s magnetic field. protects us from some of the cosmic rays that come from outside our Solar System. However, if there were a dramatic increase in the number of cosmic rays entering the solar system, it could change the amount of high energy cosmic rays that would be able to reach Earth’s surface. Damage to the Earth's ozone layer could occur and cosmic rays may cause damage and mutation to DNA. CLICK TO PLAY MOVIE. Clip from IBEX: Search for the Edge of the Solar System. What defines the boundary of the Solar System? What happens when the solar wind and the interstellar medium collide? What is the bow shock or bow wave? What is the termination shock? What is outside the boundary of the Solar System? How do cosmic rays affect DNA? What are energetic neutral atoms?